The Compassionate Side of Bloggers | A Savings WOW! When I started blogging almost 4 years ago, I didn’t realize that there was this world called “the blogosphere.” I started blogging to share money-saving tips with those that attended the classes I was teaching on how to save money using coupons, finding deals, and being smart shoppers. Never in a million years did I think that the blog would take off and blast me into the blogosphere at full force. The biggest thing that surprised me is the sheer number of bloggers out there that blog about a variety of topics. I had no idea that there were conferences and events just for bloggers, but once I started attending them, I was hooked. I was able to learn things that helped me to improve as a blogger, but more importantly, I met some wonderful people, most of whom have become great friends to me and my husband, Jim, and our kids. Why am I writing about this? Last week, Jim and I headed down to Florida with our family for the 2013 Disney Social Media Moms Celebration. We decided to extend our stay and enjoy Disney World after the conference. While in Florida, Jim suffered a stroke the day before we were supposed to head home. Being in Florida with just the kids when all of this happened, without our family around, was not the ideal situation. When I posted a request on my personal Facebook page for prayers to be sent to Jim, I was truly overwhelmed at the response. I’m still overwhelmed as there are so many people who have shared this request and contacted me about how they can help our family. Some of these people are bloggers that we’ve met only once before in real life but have had conversations with online. Some of these bloggers have never even met us in real life and still want to help. Melanie of My Joy My World has been a rock for us and her post really touched our hearts. (Full disclosure: Melanie is my cousin and is like a sister to me.) Margie and Mike of My Springfield Mommy had dinner with us the night before it happened and when they heard the news, shared it with the other Disney Social Media Moms so they could send prayers our way. MJ of Chicagonista also shared our journey with our Chicago Social Media Moms group so they could send their prayers our way. 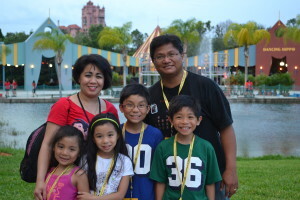 Maricris of Zensible Mama reached out to Leanne of Disney World and Maria of BSM Media to let them know since they are in Florida. She also encouraged others to send prayers our way. The biggest thing I want to point out is the compassionate side of these bloggers, and so many other bloggers in the various groups that we are involved in, that took time out of their lives to check on us to see how we’re doing or post an uplifting message on our Facebook pages. We’re so blessed and grateful to have all of these people in our lives and to be in the blogosphere with them. The next time you read about any catfighting or negative experiences between bloggers, I want you to remember that most bloggers have a compassionate side that can help lift us all up and be positive examples in our blogging communities. They are there for those of us in our time of need, ready to lend a hand. It’s just amazing to me how powerful it can be when we all work together instead of tearing each other down. There is room for all of us in Cyberspace and we just all have to remember that. For all of you out there who have sent us messages, called or texted, Tweeted, emailed, posted on Facebook, etc., you will never know how much all of that has meant to us. It gives us hope, strength, and inspiration as we go through this medical crisis. Even though I may not be able to respond to each of you directly, please know that I am reading all of the messages and telling Jim about them. As we go through Jim’s road to recovery, it gives us peace of mind to know that we have this support group. He’s not out of the woods yet and the doctors are monitoring his progress every day. We appreciate your continued support on our site and your positive thoughts! Just remember we are all thinking of you and if we can do anything just let us know. Wishing all of you the very best! Keeping your family in my thoughts and prayers. Please let us know if there is anything you need. It is a beautiful thing to have a community, friends and loved ones support and help in this way. We continue to keep you all in our thoughts and prayers. Great post, and I’m so glad you feel supported. I love watching the troops rally, especially when I can be a part of it, even if it is under poor circumstances. Had we known what was happening, we would have loved to help you! We were down there all last week as well. I am so sorry to hear about your husband and will be praying for you all now and am so very thankful that you had others helping you out during this time. You know we’re all thinking about you and want the best for you. You’re beloved and a strong person. Hang in there – we’re here for you. We continue to pray for Jim and think about you and the kids. It’s truly amazing to see the compassion of the blogging community. I’m glad we had a chance to connect and pray for a success recovery for Jim. BIG hugs to you and your whole family, Maria! This is such a difficult situation that it just shows how positive and wonderful you are to be looking at the silver lining and appreciating all of the compassion. I’ll be thinking of you! You have been in our prayers daily. I’ll never forget meeting your husband and how happy he was in Disney. Missing you guys and hoping for a speedy recovery. The Kachelmuss kids sends sloppy kisses! You’re still in all of our thoughts, hon. Hope his recovery is swift. I’ve been thinking of you since I heard this – I’ve been praying for Jim and for you and your children. Hope to see that ever ready smile on Jim’s face soon! I had no idea…and I’m so sorry. Sending you all lots of prayers. If you are still in Florida, please email me. I must have been living under a rock because I am just now hearing about this. I am so sorry to hear about Jim, but I am sending prayers his way for a speedy recovery. So glad to hear that so many bloggers came forward to show you love! Although we didn’t meet at the conference this year, I have been following your story closely and want to send you a big hug and lots of positive energy all the way from California. I cannot imagine what your family is going through right now. My husband’s doctor thought my hubby had a stroke a couple of months ago (we still don’t know what it was) and I was a wreck with worry. You are a very strong mama! Please keep us posted on your husband’s recovery. I had no idea!! How scary for you and your kids!! I’m glad to hear that you got the support you needed and I wish a fast recovery for your husband, I will keep you on my prayers. Having just met you while shooting a video the day before Jim’s stroke I hanen’t been able to get you off my mind since. What a difficult time. I keep asking Tara what she knows and what we could do to help. I had such a great time capturing video of you and your family and my heart just hurt when I heard the news. I’m am still sending all the positive vibes your way and hope Jim has a full recovery. Thank you very much for your kindness Jimmy! We had a great time during the video shoot with you. Jim is recovering right now and is making progress every day.